Even in normal water conditions never underestimate just how close to the riverbank salmon will run & hold. This becomes even more relevant during high water conditions where the only break from the higher water pressure for a salmon is right in tight to the riverbank. Salmon Fishing Brains Not Brawn! It's like some sort of testosterone driven psychological affliction that we look at a salmon river and assume the fly or lure needs to be right out in the middle or near the far bank as that is where salmon are always to be found. Salmon always take the 'course of least resistance' when running up a river and often that route in higher water conditions will be within only a few yards of the riverbank. These close to the riverbank pockets of slacker water also double up as holding areas for resident fish when the river rises giving them a double importance to your salmon fishing approach if you can identify them as you're fishing. Looking at a salmon pool in any height of water to work our whether you're targeting briefly pausing running fish or resident fish (or sometimes both) will often give you a tactical fishing advantage. 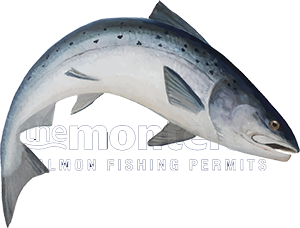 A clear and defined battle plan of where and at what distance salmon will be present should be constantly calculated and frequently reviewed while fishing. Let the flow pace and sometimes any water level fluctuations dictate these areas as you fish down through the pools and remember it's only one well enough thought out cast in the correct area of a salmon pool that'll make your fishing day complete! When you've seen enough and have complete faith in the type of water salmon love to hold in along with exactly how close to the riverbank their flight path can often be it can easily change your thoughts on salmon fly distance and how far you even need to wade into the river. Many times over the years I've advised anglers to stay at ankle depth and fish a short line on certain pools at certain water heights for my advice to be ignored for a fish to then 'head & tail' between the angler and the riverbank. I used to love seeing that as nothing further needed to be said and the next time I offered valuable salmon beat advice I knew they would listen! Salmon will sense any disturbance to salmon pool as 'awareness' plays a big part in their survival defence mechanism. A salmon angler who's waded too quickly & too deeply into the neck of a salmon pool (and especially a pool that has an inside meander in it) would be as well to have launched in half a dozen half bricks! The salmon's nose for sensing water pressure changes and lateral line for picking up vibrations will already be on 'red alert' the split second the fish feels the sudden water pressure changes from an angler who's displaced the river flow upstream. The 'mysterious' thing I've noticed when salmon fly fishing is that my own salmon take rate goes through the roof when I've got my wellies or trainers on!